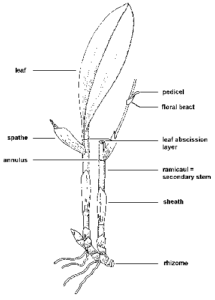 The main stem is the portion of the primary axis of the plant which develops from the plumule axis. An axis, together with the leaves which it bears, is called a shoot. A branch is also a shoot, for it consists of an elongation axis or stem with its own set of leaves. The stem or shoot tends to grow upwards into light and air. It bears leaves, flowers and fruits. Its growing apex is covered over by a number of young leaves which form bud. The part of a stem from which a leaf arises is called a node, while the region between two successive nodes is known as inter node. The flowering plants maybe classified into annuals, biennials and perennials according to their length of life. Annuals: These live for only single growing season, after which they die. They produce seeds which, on germination develop into new plants the next year. Most herbaceous plants are annuals, e.g., poppy tomato, wheat, rice, etc. Biennials: These live for two growing seasons. During first season, they develop leaves on short stems and store up food in their tap roots. The leaves die away at the end of season. During the following season the stored food is utilized for the production of flowers and fruits, after which the plants die, e.g., radish, turnip, carrot, etc. Perennials: These live for several years, and usually produce seeds annually. All woody plants and some herbs are perennials. The following descriptive terms are used for the description of stems. Herbaceous: Soft and green can be easily bent or broken as in Brassica, Poppy, etc. Fistular: Internodes hollow, as in Bamboo. Solid: Not hollow, as in most trees. Jointed: Swollen at the nodes, as in Grasses, Sugar-cane etc. Cylindrical: Straight and round (i.e., circular in transverse section) e.g., Rose, Jasmine, Sunflower etc. Angular: Having alternate ridges and furrows as in Oscimum basilicum (Niazbo). Flattened: Flat and plate like as in Opuntia. Glaucous: Surface smooth and more or less shiny, bluish-green, as in Bamboo. Glabrous: Surface smooth but not shiny, having no fine hairs, as in Brassica. Succulent: Thick and fleshy as in Opuntia and Euphorbia royleana (Danda Thore). Spiny: With spines or thorns on the surface, as in Duranta, Acacia etc. Prickly: With prickles (spine like) on the surface, such as Rose. The stem maybe aerial or underground. The aerial stems grow above the ground and are exposed to the air. They may be reduced, erect or weak. Reduced Stems. These are found in radish, carrot, and beet, and are in the form of small green structures above the thick roots. They are so small that the leaves appear to be borne directly on the root. Erect Stems. They are thick and strong and can grow erect as in most herbs and shrubs. Weak Stems. They are unable to grow erect, and therefore, expose their leaves to the air and light either by climbing up the neighbouring objects or by spreading themselves on the ground. Thus, they may be climbing or trailing and the plants possessing them are respectively as climbers and trailers. The climbers develop relatively weak and slender stems which cannot grow erect. They climb up the support either by coiling around it or by developing special organs by means of which they become attached to it. According to their modes of climbing they are divided into. The twining plants have long slender stems with long internodes. They do not develop any special organs for climbing, but their main stem and branches coil or twine round the support. The direction of the twining movement of the stem-apex, looked from above, may be clockwise (from left to right) as in hop or counter-clockwise (from right to left) as in Convolvulus (Karari), Ipoemoea (Ishq Pecha), bean and Cuscuta. These plants develop long, slender structures known as tendrils, by means which they climb up the support. The young tendrils are sensitive to contact. When an apical portion of the tendril touches a support. Its twines round it. The whole tendril then becomes coiled into a spiral. Leaflets of the compound leaf are modified into tendrils. In the glory-lily (Gloriosa) the tips of the leaves are modified into to form tendrils. These climbers attach themselves to the support by means of small adventitious roots which arise from the side of the stem where it comes in contact with the support. Such roots are sensitive to contact. They penetrate into the cracks or the crevices of the supporting stems of the trees, and usually produce a sticky fluid which on hardening fixes them to the solid objects, as in ivy (Hedera helix) and pepper (Pipper). Sometimes they are large, and clasp rounded the support, as in orchid vanilla. These plants scramble up by wards by producing numerous hooks on their long, slender shoots which either rest on support or weave themselves among the branches of more rigid plants., e.g., Blackberry, Raspberry and Bougainvillea. In these plants the stems spreads out along the ground to expose their leaves to sunlight. Stem lying close to the throughout their length are known as prostrate as in Tribulus terrestris (Bhakra) Solam xanthcarpum (Mamoli). Creepers: The main stem spreads out along the ground, develops adventitious roots at the nodes and dies away between the nodes. The nodes which thus survive give rise to new plants, as in ground ivy (Nepeta), and creeping jenny. Runner: The runner is the slender shoot which runs along the surface of the ground and attains a considerable length. It arises in the axial of a leaf of the parent aerial shoot, and possesses long inter nodes. The nodes bear small scale leaves, each having a bud in its axial. e.g. Grass (Cynodon dactylon), strawberry, Hydrocotyle (brahmi booti), etc. Stolon: The stolon is much elongated runner which bends downwards and either enters the soil or simply touches it at its tip. After giving off adventitious roots into the soil at this point, it turns upwards and its terminal bud develops into a new plant. By the death of the stolon the new plant becomes separated from the parent plant, as in blackberry, jasmine, etc. Offset: The offset is a short, thick runner which turns up at its end, gives off adventitious roots into the soil and develops into the new plant, as in Agave. By leads an independent existence. Sucker: The sucker is an underground runner or shoot which arises from an axillary bud on the underground portion of an old erect stem. It grows horizontally for some distance in the soil, and then turns upwards and give rise to an aerial erect shoot or a new plant, giving off adventitious roots into the soil at the base, as in the mint and dead-nettle. Suckers may also arise from adventitious buds on the roots, as in raspberry, rose, plum, cherry, poplar, willow, Delbergia sissoo (Sheesham), etc. In the poplar, willow and Delbergia, the suckers may develop from the roots at the long distances from the main trunk. In many perennial herbs, which live from year to year, part or whole of the stem grows underground, these underground stems are often thick and swollen because of the food material (commonly starch) stored up in them. 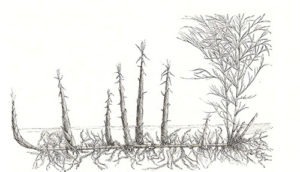 The underground stems resemble roots but can be readily distinguished from the latter by the presence of (1) nodes and inter nodes, (2) scale leaves with buds, and (3) by the absence of root cap at the growing apex. Moreover, they arise from buds in the axils of leaves. There are four principal types of underground stems, namely, the rhizome, corm, bulb and stem tuber. Rhizome: Rhizome is an elongated, underground stem which is usually more or less thick and fleshy, containing a large amount of reserve food. It grows horizontally beneath the surface of the soil, and has distinct nodes and long or short inter nodes. Usually at each node there is a small scale-leaf with a bud in its axial. Adventitious roots are given off from the nodes, especially from the under surface. 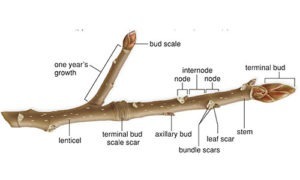 The aerial shoots may develop from buds in the axils of scale leaves or from apical buds. Such typical rhizomes are found in ginger (Zingiber) Turmeric (Haldi), Canna (Akik), Solomon’s seal (Polygonatum) etc. It has distinct nodes and inter nodes. It has no nodes and inter nodes. There is a terminal bud, but no, root cap. There is a root cap at its apex. Scale leaves with bus in their axils are present at their nodes. Scale leaves are not present. 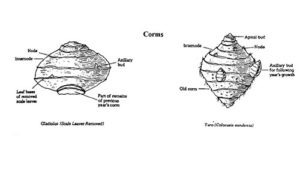 Corm: The corm is a thick solid, more or less rounded, underground stem with a few internodes only. It may be regarded as a condensed form of rhizome. It is covered with a number of loose, sheathing scale leaves which arise from the nodes. In the axils of the scale leaves are developed on the more bud. As in Zaafran. Bulb: The bulb is a specialized underground root. The stem or axis is reduced to a short broadly, conical disc which gives off adventitious roots from its under surface. On the upper surface of disc there are borne large, fleshy scales contains store food material and the bulk of the bulb. The fleshy scales may either be small scale leaves or broad basal portions of foliage leaves whose upper green parts have died away. The disc bears on its upper surface. The apical bud lies in the center of the disc which is morphologically equivalent to the apex of a normal elongated stem. The lateral bud lie in the axils of the fleshy scales. In these bulbs, the bases of the foliage leaves store up for food and become thick and fleshy. The inner fleshy leaf-bases completely enclose one another in a concentric manner, while the outermost leaf bases, which do not contain stored food, dry up to form a membranous covering or tunic. The tunic protects the bulb against drying up and mechanical injuries. Tunicated bulbs are found in the onion, garlic, tulip etc. Scaly or Lubricated Bulbs: In scaly bulbs, the disc bears two kinds of leaves, the foliage leaves on scales leaves. The foliage leaves die away at the end of the season and the food material is stored up in the scale leaves which become thick and fleshy. The fleshy scale leaves overlap each other at the margins. There are no outer dry scales. An apical bud is present in the center of the disc, and there may also be one or more axillary bud. Scaly bulbs are found in lily. (Lilium). Stem Tuber: The stem tuber is a swollen underground part of the stem which serves both for storage of food and for vegetative propagation of the plant, as in the potato plant. In the potato plant several axillary branches arise from the basal underground portion of the stem and grow more or less horizontally outwards. They bear scale leaves, from the axils of which other branches are given off. The foliage leaves prepare food, the surplus which is stored up in the tips of these underground branches. The swollen tips of the underground axillary branches are known as stem-tubers. The potato tuber consists of several inter nodes, bearing small scale leaves at the nodes. In the axils of the scale leaves are groups of lateral buds called ‘eyes’, which are situated in small depression. Each group of bus represents a lateral branch with undeveloped inter nodes. At the unattached end of the tuber there is also an eye, which in reality represents a terminal branch an apical bud. Some stems are so highly modified that they do even not look like stems. This is due to the fact that they perform functions widely different from those of ordinary stems. Their stem nature, however, can be distinguished by their position, mode of development and internal structures. Some of these specialized stems will now briefly be described. In many weak-stem plants the shoots are modified into slender, thread like structures known as tendrils, which are highly specialized climbing organs. The tendrils are often branched and may be leafless or may bear small-scale leaves. They are sensitive to contact. When the apical part of a tendril touches a suitable support, it twines around it, and then the whole tendril form a spiral which, like a wire-spring, draws the plant closer to the support. In some plants growing in dry hot places true leaves are reduced to scales to prevent loss of water by transpiration, while the stems are flattened, green and leaf like, and perform the function of a leaf. Such leaf like stems are called phylloclades (if they are composed of more then, one internode) or cladodes (if they consist of a single internode). Phyllocladodes are found in Opuntia, Ruscus, certain Euphorbias and numerous cacti, all of which inhabit dry and sunny places. Cladodes occur in Asparagus which is also a desert plant. In Opuntia, the plant body consists of flat, green, fleshy phylloclades, each of which consists of a large number of internodes. In the butcher’s broom (Ruscus), the phylloclades are green flat and leaf-like. Each phylloclade arises in the axial of a small, linear scale-leaf which usually falls off, leaving a small scar. In many plants growing in dry hot places the axillary branches or sometimes the apices of the main shoots stop growing after sometime and become hard and sharp pointed. These are known as stem spines or thorns. They can be easily recognized as stem structures, by the fact that they occupy the position of the buds and sometimes bear leaves and flowers. Frequently the leaf which bears a spine in its axial falls off, leaving a scar at the base of the spine. The flower is a specialized shoot which arises in the axial of a leaf called the bract. The enlarged tip of the stalk of the flower, which bears floral leaves (petals, sepals, etc. ), is called the thalamus or torus. The floral leaves are modified foliage leaves. To bear leaves, flowers and fruits, an expose them to air and sunlight. To conduct water and dissolved mineral salts from the roots to the leaves and the prepared food material from the leaves to the different parts of the plant body. To store reserve food, e.g., rhizome, corm and stem tuber. To conserve water supply and perform the functions of foliage leaves e.g., phylloclades and cladodes. To serve as climbing organ, e.g., stem-tendrils. To protect against the attacks of grazing animals, e.g., stem-spines. To serve as organs of storage, e.g., rhizome, corm, bulb, etc. To serve as means of vegetative propagation e.g., rhizome, corm, bulb, stem-tuber runner, sucker, offset, etc.